The Bible tells us to watch and be ready for the return of Christ. But watch what? With so much going on in the world, how can we distinguish between important and unimportant news? Just where do we focus our attention? We see a European power bloc developing. We hear of right-wing activities in Germany and Austria. We listen to the Catholic Church proclaim that it is the only true Church of Christ. Some speculate that these developments could lead to a European economic superstate with one single currency, one political and military system, and even one religion. But would this be a good thing? Would such a Europe be on good terms with the United States of America? Just what does it all mean? As surprising as it may seem, what is developing in Europe has been foretold, and is happening exactly as prophesied in the pages of a very ancient book—­­the Holy Bible. God inspired the writings in His Book, and His prophecies are real. No man could have foreknown these things, nor could any man have had the power to direct such events to happen exactly as told. But Almighty God has done just that. And He has made it possible for us to know what He is doing in world affairs—past, present and future (Amos 3:7). Without viewing history through the pages of the Bible, we cannot correctly interpret current events. So let us see where God says these events are leading. When the Babylonians conquered and destroyed the ancient city of Jerusalem, they took some of the Jews captive and brought them to Babylon. One of the Jewish prisoners was Daniel, who was at that time still a very young lad. You may be familiar with the story of how Daniel was thrown into the lions’ den and how God spared his life. Or you might have heard about his three friends, also Jewish captives, and how God spared their lives in the fiery furnace. But did you know that Daniel was also one of the greatest prophets ever? God revealed events to Daniel that are NOW coming to pass. Daniel himself did not understand everything God inspired him to write, as these things were written for us to understand today (Dan. 12:8-10). In Daniel 2, Nebuchadnezzar, the king of Babylon, had wondered about what would happen after his reign. He wanted to know the future, so God sent him a peculiar dream to let him know what would happen. However, the king could not interpret the dream. So he turned to his sorcerers and astrologers. But in order to trust their interpretation, he did not tell them what he had dreamt, requiring instead that they tell him. Yet none of them could. When Nebuchadnezzar learned that Daniel was able to interpret dreams, he sent for him to interpret this strange dream. God revealed the contents of the dream and its meaning to Daniel, and he was able to relay this to the king. Daniel first tells the details of the dream: “You, O king, were watching; and behold, a great image! This great image, whose splendor was excellent, stood before you; and its form was awesome! This image’s head was of fine gold, its chest and arms of silver, its belly and thighs of bronze, its legs of iron, its feet partly of iron and partly of clay. You watched while a stone was cut out without hands, which struck the image on its feet of iron and clay, and broke them in pieces. Then the iron, the clay, the bronze, the silver, and the gold, were crushed together, and became like chaff from the summer threshing floors; the wind carried them away so that no trace of them was found. And the stone that struck the image became a great mountain and filled the whole earth” (Dan. 2:31-35). Imagine Nebuchadnezzar’s amazement! How could this Jewish slave know these things when none of his magicians could tell him? Verse 36: “This is the dream. Now we will tell the king the interpretation.” Daniel refers to “we,” yet he was alone. Daniel acknowledged that God was speaking through him. This was not Daniel’s own private interpretation. He continues in verse 37, “You, O king, are a king of kings. For the God of heaven has given you a kingdom, power, strength and glory…you are this head of gold.” Nebuchandnezzar was pictured in this image as the king of the first world-ruling empire from that time forward, the Chaldean or Neo-Babylonian Empire. But this dream was not just about Nebuchadnezzar. It also pictured events that would take place after his reign. Daniel continued in verse 39, “But after you shall arise another kingdom, inferior to yours; [depicted in the statue as the chest and arms of silver] then another, a third kingdom of bronze, which shall rule over all the earth [the belly and thighs of bronze]. And the fourth kingdom shall be strong as iron…and [it will] crush all others [the legs of iron].” The ten toes [iron and clay] symbolized ten kings who would rule together at the very end before the return of Christ. When these ten kings come into power they will rule for only a short time. For God will send Jesus Christ to set up a kingdom that will crush all human governments, symbolized by the STONE dashing the feet of the image and crushing it (vv. 41-45). The dream depicts ONLY FOUR successive world-ruling empires in history from the time of Daniel. The first, as we’ve seen, was the Neo-Babylonian Empire. What was the second one? Daniel 5 gives us the answer. The Babylonian King Belshazzar, a descendant of Nebuchadnezzar, gave a feast during which he desecrated the holy things taken from the temple in Jerusalem. Suddenly, fingers of a hand were seen writing the famous words “MENE, MENE, TEKEL, UPHARSIN” on the wall (vv. 24-25). No one could explain the meaning until Daniel, now an old man, was called. He told Belshazzar that God had decreed that his kingdom would be taken from him and given to the Medes and the Persians. That same night, Belshazzar was slain and Darius the Mede received the kingdom (v. 30). Thus, the arms of the statue of Nebuchadnezzar’s dream represented the kingdom of the Medes and the Persians. What, then, is the identity of the third kingdom? In Daniel 8, God gave Daniel himself a vision. In it he saw a ram with two horns. The second horn came up later and was higher than the first horn. This ram was a conquering animal, which no other animal could withstand, until a male goat with one horn very swiftly entered the scene. It attacked the ram, cast him down to the ground and trampled him. After that, this goat became very great. God sent the angel Gabriel to explain the meaning of the vision. Verse 20: “The ram which you saw, having the two horns, they are the kings of Media and Persia.” As we’ve seen, when Babylon was conquered by the Medo-Persian Empire, the conquering kingdom was ruled by Darius the Mede. But later, the Persian side of the kingdom became more powerful, which is why the second horn, which came later, was greater than the first one. In any case, it should be clear that the goat which trampled the ram symbolizes the third world-ruling empire. And just what empire did the goat represent? Daniel 8:21: “And the male goat is the kingdom of Greece. The large horn that is between its eyes is the first king.” In studying history, we can see that Greece, after its takeover by the Macedonians, did subdue and conquer the Medo-Persian Empire. That would make its most powerful king, Alexander the Great, the large horn in Daniel’s vision. Indeed, when Alexander was later in Judea, he would be shown this account in the book of Daniel and would himself acknowledge that this prophecy was about him. The angel Gabriel went on to explain that after Alexander’s death, his empire would be divided among four powers. Verse 22: “Four kingdoms shall arise out of that nation, but not with its [same] power.” Again, history confirms that that is exactly what happened. When Alexander died, his empire ended up divided among four of his generals. It’s awesome to realize that this prophecy, given hundreds of years before these events, was fulfilled exactly as it had been foretold. We have now identified the first three world-ruling empires from Daniel’s time—the Neo-Babylonian, the Medo-Persian and the Greco-Macedonian Empires. What is the fourth? In chapter 7, God had given Daniel another dream—this one involving four great beasts coming up from the sea. An angel explains that the beasts represent four kings or kingdoms. Daniel 7:4: “The first was like a lion, and had eagle’s wings. I watched till the wings were plucked off; and it was lifted up from the earth and made to stand on two feet like a man; and a man’s heart was given to it.” This clearly describes the Babylonian Empire and its most powerful king, Nebuchadnezzar. Because of his pride, Nebuchadnezzar was made insane for seven years, living like an animal, until God restored his sanity (Dan. 4). This restoration is symbolized here by the heart of man being given to the beast, and by the fact that it is now standing like a man, having lived previously like an animal. Daniel then describes the second beast as a bear (7:5), which represented the second world-ruling empire, the Medo-Persian Empire. This would be followed by a third beast described by Daniel as a leopard in verse 6: “After this I looked, and there was another, like a leopard, which had on its back four wings of a bird. The beast also had four heads, and dominion was given to it.” The third empire, as we’ve seen, was the Greek Empire. The wings of the bird show how swiftly Alexander conquered the world, as also symbolized by the swiftness of the goat in the other vision. The four heads of this beast represent the four generals among whom the empire became divided after Alexander’s death. They were also symbolized as the goat with four horns. The meaning is explained in verse 23: “The fourth beast shall be a fourth kingdom on earth, which shall be different from all other kingdoms, and shall devour the whole earth, trample it and break it in pieces. The ten horns are ten kings who shall arise from this kingdom.” So the beast with iron teeth would be different from the previous kingdoms because ten kings or kingdoms would arise from it. Keep in mind now Nebuchadnezzar’s dream of the statue with its iron legs and its feet and ten toes of iron and clay. What kingdom or empire replaced the Greek Empire and its four divisions? History tells us that it was the empire of Rome. The fourth beast that Daniel sees in this vision with its iron teeth symbolizes the fourth world-ruling empire—the Roman Empire—which is to last until the return of Christ. But how can that be? Is not the Roman Empire long gone—a relic of the past? We must remember that the Bible tells us that ten kings would come out of the fourth kingdom. In other words, the Roman Empire would fall, but it would survive through ten renewals or resurrections, all the way up until the return of Christ. Amazingly, the tenth and very last resurrection of the Roman Empire is in the process of forming in Europe right now! And this tenth resurrection will last until the coming of Christ. Yes, Christ’s return is imminent! This is why it is critical to watch and understand what is happening on the world scene. In the Book of Revelation, Jesus Christ revealed end-time events to the Apostle John. Like Daniel, John sees peculiar looking beasts that symbolize world-ruling empires. John describes what he saw in one of those visions in Revelation 13:1: “I saw a beast rising out of the sea, having seven heads and ten horns, and on his horns ten crowns, and on his heads a blasphemous name. Now the beast which I saw was like a leopard, his feet were like the feet of a bear, and his mouth like the mouth of a lion.” The parallels with the four beasts that Daniel saw earlier are remarkable—the first beast in Daniel’s vision was like a lion, the second like a bear and the third like a leopard. Here John sees only one beast, but it has combined elements of all the beasts that Daniel saw—a lion, a bear, and a leopard. In addition, the beast John saw had seven heads. And if you count the heads of the four beasts Daniel saw, there are seven heads too—the head of the lion, the head of the bear, the four heads of the leopard, and of course the head of the fourth beast. Furthermore, the beast John saw had ten horns, and the fourth beast Daniel saw had ten horns as well. The beast John saw represents the Roman Empire. It is seen as one composite beast, as it had swallowed up the previous three kingdoms. The Babylonian, Medo-Persian and Greek empires had already come and gone—although their territory and characteristics had been absorbed by Rome. Let’s follow the history of the Roman Beast. Revelation 13:3: “I saw one of its heads as if it had been mortally wounded, and his deadly wound was healed.” The Roman Empire fell and the world believed it would never rise again (symbolized by the deadly wound). But God revealed through Daniel and through the Apostle John that there would actually be ten revivals of the Roman Empire, nine of which have already occurred. After the destruction of Rome, three so-called “barbarian” powers, who were all followers of an unorthodox nominally Christian faction called Arianism, revived the Roman Empire. This happened under King Gaiseric of the Vandals, under King Odoacer of the Heruli, and under King Theodoric of the Ostrogoths. These are the first three horns of the fourth beast that Daniel saw—the first three resurrections of the Roman Empire. The fourth resurrection then occurred under Justinian in A.D. 554. At that time, lands of the old West Roman Empire were taken back from the Arian “barbarians” by the Romans of the Eastern Empire under its emperor, Justinian. He also restored the rule of “orthodox” Roman Catholicism to the West. Known in history as the Imperial Restoration, this is understood by many to be the biblical “healing of the deadly wound” the Roman Empire had received from the barbarian powers. The fifth resurrection occurred under Charlemagne (Charles the Great) in A.D. 800. The sixth occurred under Otto the Great in A.D. 962. The seventh occurred under Charles V of Hapsburg in 1530, the eighth under Napoleon Bonaparte ruling from 1804 until 1814, and yes, the ninth has also already occurred, under Mussolini and Hitler. Thus, what is happening right now in Europe is the tenth and final resurrection of that same Roman Empire. As we can see, putting the prophecies of the Bible together with history gives understanding to the past, the present and the future. Let us look now at Revelation 17, where John is given another vision of a beast with ten horns. He writes, “The ten horns which you saw are ten kings who have received no kingdom as yet, but they receive authority for one hour [for a very short time] with the beast. These are of one mind, and they will give their power and authority to the beast. These will make war with the Lamb, and the Lamb will overcome them, for He is Lord of lords and King of kings” (v. 12). These ten kings will try to conquer Jesus Christ when He returns, but will be defeated—as depicted by the stone in Daniel 2 shattering not only the toes, but the whole statue. These prophecies, we can see, fit together like small pieces of a big puzzle, and, once put together, they form a big picture. It is exciting to understand what God reveals about world events through these prophecies! According to these visions of Daniel and John, the final resurrection of the Roman Empire would involve ten kings, all in power at the time of Christ’s return. Europe is being directed to fulfill these prophecies as nations attempt to unite, first on the basis of economics, but ultimately on the grounds of military interests and religious unity as well. There is already talk among European leaders about a federal constitution to govern the participating nations. History unfolds exactly as the Bible foretells. The word “beast” in biblical terminology can refer to a system of government and to the leader of that system, just as the words “kingdom” and “king” refer to an empire and also to the leader of that empire. 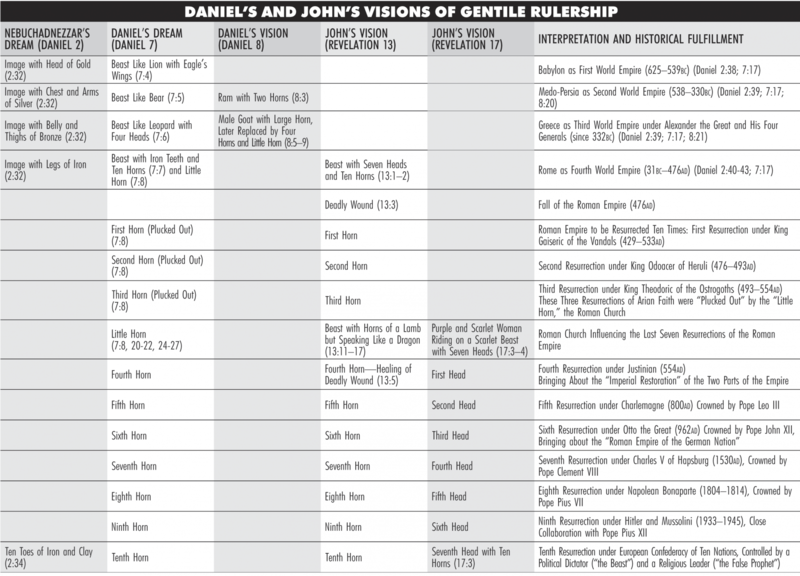 Daniel and John both saw beasts in their visions, identified as world-ruling empires. But every empire has a leader. Can we identify the actual leader of the final resurrection of the Roman Empire? Revelation 19:19 says that the Beast, the kings of the earth, and their armies, gather together to fight against the returning Jesus Christ. The Beast here refers to an individual who will lead the kings of the earth and their armies to fight Jesus Christ when He comes back. He is the final end-time leader of the revived Roman Empire. God reveals more about this end-time leader in Daniel 11. This prophecy starts with the rule of Persia (the second empire) and covers the subsequent centuries and events all the way up to the return of Christ. The king of the North is the final leader of the revived Roman Empire and the king of the South is a mighty leader in the Arab region of the world. We may not yet know the emerging European leader who will become the king of the North, but the Bible describes his nature. Daniel 11:36 says, “Then the king shall do according to his own will; he shall exalt and magnify himself above every god, shall speak blasphemies against the God of gods, and shall prosper till the wrath has been accomplished; for what has been determined shall be done.” The “wrath” is a reference to the wrath of God spoken of in the book of Revelation. God will be angry with all nations because they have forsaken Him and are living so wickedly, just as in the time of Noah. This final leader of the Roman Empire, then, will exalt himself until God’s wrath strikes him down. This means war in the Middle East! A war that will spread to countries of the former Eastern bloc. A coming “United States of Europe,” under the leadership of the king of the North, will engage in a worldwide war with the Middle and Far East! Yes, another world war! Then in verse 45: “And he shall plant the tents of his palace between the seas and the glorious holy mountain [Jerusalem]; yet he shall come to his end, and no one will help him.” Why will no one help him? What about the United States of America, Canada, Australia, New Zealand and Great Britain? They don’t seem to be mentioned here in this war triggered by the united Europe. Are they neutral? No. By the time this prophecy is fulfilled, these nations will no longer be free to help. Historical and archaeological records in the light of biblical evidence have clearly shown that Great Britain and the United States of America are descended from Ephraim and Manasseh, the sons of Joseph of the tribe of Israel. (The modern state of Israel is descended from Judah, also of the tribe of Israel.) It has also been learned that the modern German-speaking nations are the descendants of the biblical Assyrians. Jareb was not the name of any historical Assyrian emperor. Instead, King Jareb of Assyria is actually the king of the North and the leader of the end-time united Europe. The word Jareb in Hebrew connotes a fighter, one who is quarrelsome or one who will contend. And indeed, he will be a fighter and will be quarrelsome. Many Bible translations call him the Great King. He may be even called by the title, “the Great,” just like others before him—Otto the Great, Charles the Great and Alexander the Great. This prophecy seems to indicate that Ephraim, England and the British Commonwealth, as well as Judah, the Jews, are first on good terms with Assyria, Germany. They even ask them for help, but it won’t come. And soon thereafter, any friendly relationship will change. Right now Europe enjoys a fairly good relationship with Great Britain and the United States. But this will not last, and the whole world will be astonished at the change! Hosea 7:11: “Ephraim also is like a silly dove, without sense—they call to Egypt [for help], they go to Assyria [for help]. Wherever they go, I will spread my net on them; I will bring them down like birds of the air; I will chastise them according to what their congregation has heard.” Now why would God do such a thing? Hosea 9:1 answers: “Do not rejoice, O Israel, with joy like other peoples, for you have played the harlot against your God.” In other words, the modern nations of Israel and Judah have adopted pagan customs and rejected the worship of the true God. God warns through prophecy what He is going to do and why, so there can be no doubt. In Ezekiel 39:23, God states, “The Gentiles will know that the house of Israel went into captivity for their iniquity; because they were unfaithful to Me, therefore I hid My face from them.” Even Gentile nations will know why God is allowing this captivity of the modern-day descendants of Israel and Judah. The Germans will be the dominant people of the coming united Europe, which.will conquer both the United States of America and Great Britain as well as the Jews, transporting captives to Europe and Egypt. This will all happen just prior to the return of Jesus Christ—for, in the remainder of Ezekiel 39, the prophet reveals that Christ will come to free the captives and bring them back into their land. Christ will come back to make an end of the war and destruction going on. Conditions will be so terrible that if Jesus Christ were not to intervene, all of mankind would be annihilated. He states in Matthew 24:22, “And unless those days were shortened, no flesh would be saved [alive], but for the elect’s sake those days will be shortened.” That means no human being on the face of the earth would survive. You need to understand what is happening and what you need to do to be saved. Verse 33: “For Tophet was established of old, yes for the king of Assyria it is prepared.” Now who or what is Tophet? Tophet is a Hebrew word meaning “a burning place” or “a lake of fire.” A lake of fire, then, is prepared for the king of Assyria. God has made this Tophet, this lake of fire, deep and large. Verse 33 continues, “Its pyre is fire with much wood; the breath of the Lord like a stream of brimstone, kindles it.” This correlates with Revelation 19, where the Beast, the end-time leader of the Roman system, will be thrown into a lake of fire and brimstone when Jesus Christ returns. It is interesting to note that at least three leaders, and possibly as many as seven leaders, of the various revivals of Roman Empire were descendants of the Assyrians. And the Bible informs us that the last leader, called the king of the North, the Beast and King Jareb, will also be an Assyrian. For this reason, we must pay close attention to what is happening in Europe, and among the Germans in particular. In Revelation 17, the Apostle John is given a vision of a different beast than the one in chapter 13—this one being a scarlet beast but also having seven heads and ten horns. The most striking difference, however, is that the scarlet beast is ridden by a woman—a harlot. Revelation 17:5 identifies the woman as “mystery, babylon the great, the mother of harlots and of the abominations of the earth.” This woman is depicted in verse 6 as drunk with the blood of the martyrs of Jesus. In verse 18 the woman is also identified as that great city that reigns over the kings of the earth, the city that sits on seven mountains (v. 9). Though here called Babylon, the famed City of Seven Hills is the city of Rome!—successor to ancient Babylon politically, militarily, economically and religiously. It is this city that rides the scarlet beast with the seven heads and the ten horns. The seven heads of the Beast are seven kings or seven kingdoms (v. 10). These are successive kingdoms, one following the other. Five have already fallen, one is, and the last one has not yet arrived. In Revelation 13, the ten horns of the beast depicted ten resurrections of the Roman Empire. Nine, as we’ve seen, have already taken place, and the tenth is now in the preliminary stages of forming. Comparing the beast in Revelation 13 with the beast in Revelation 17, we can see that the heads of the beast in Revelation 17 depict the seven last resurrections of the Roman Empire—the very last resurrection being just ahead of us, which will include the ten horns or rulers mentioned earlier. The woman sits on these last seven resurrections of the beast. That is, the woman was only instrumental in the last seven revivals of the Roman Empire—not the first three. An interesting statement in Halley’s Bible Handbook agrees with this assessment: “The description of Babylon the great… exactly fits Papal Rome. Nothing else in world history does fit.” Unger’s Bible Handbook states, “The great harlot denotes a religious system that compromises truth for worldly power. She is guilty of prostituting truth and purity, intoxicating men by her doctrines and practices which violate the Word of God. She heads up the corrupt religious system of the end-time. It represents in fullest scope all apostate religious movements—from the inception in the ancient Babylon of Nimrod to the terrible consumation and apostate Christianity and other evil religious forces of the last day. The revived Roman Empire, with its end-time emperor—the Beast—appears as the agent of the harlot’s destruction. The woman has her headquarters in the Beast’s capital, which is the seven-hilled city of Rome” (p. 870). The first of the seven last resurrections of the Roman Empire occurred under Justinian in A.D. 554. He was the one mainly responsible for wiping out the barbarian tribes, but he did so at the behest of a succession of Roman popes. The second of the seven last resurrections occurred under Charlemagne or Charles the Great, who was crowned in A.D. 800 by Pope Leo III. The third of the seven last resurrections occurred under Otto the Great, under whose name the “Roman Empire of the German Nation” was coined. He was crowned in 962 by Pope John XII. The fourth of the seven last resurrections occurred under Charles V Habsburg, who was crowned in 1530 by Pope Clement VII. By this time, the name “Holy Roman Empire” was in popular usage because of the close contact between the state and the so-called Holy Roman Church. Then the fifth resurrection of the last seven occurred under Napoleon Bonaparte, who was also crowned by a pope. The sixth of the last seven resurrections occurred under Hitler and Mussolini. Although neither Hitler nor Mussolini were crowned by a pope, a close partnership existed between the city of Rome under Pope Pius XI and Italy and Germany. In this partnership, Mussolini signed the Lateran Treaty with the papacy in 1929, establishing papal sovereignty over Vatican City. This event affirmed Roman Catholicism as the only religion of Italy and, in turn, the papacy officially recognized Mussolini as the rightful Italian governor. Later, Mussolini would proclaim that he had revived the Roman Empire and would call himself a Roman emperor. Also, the Vatican signed a concordat with Hitler in 1933, protecting the rights of the church under the Nazi regime. This gave Hitler’s government an outward semblance of legitimacy. The seventh and last resurrection of the Roman Empire, though yet ahead of us, is already beginning. As with the previous six resurrections, the woman—the papal city of Rome—will “ride,” or direct the activities of, the seventh resurrection as well. Who or what is this little horn? An angel was sent to Daniel to explain. He says in verse 24, “The ten horns are ten kings who shall arise from this kingdom. And another shall rise after them; he shall be different from the first ones, and shall subdue three kings.” He would be responsible for the demise of the first three resurrections of the Roman Empire. “He shall speak pompous words against the Most High, shall persecute the saints of the Most High, and shall intend to change times and law.” This little horn, the religious power synonymous with the woman riding the scarlet beast, would change times and law, or rather, change the law regarding holy times. This power is described in still another way in the book of Revelation. What is this mark of the Beast? And what has the second beast, the religious power, to do with it? The mark comes from the first beast. But the second beast causes all people to accept this mark. We can get a clue about its character from what has gone before in the Roman Empire and its revivals. Notice what historian Will Durant says in The Age of Faith, volume 4 of his renowned work, The Story of Civilization, about the Code of Justinian: “This Code, like the Theodosian, enacted orthodox Christianity into law. It began by declaring for the Trinity…. It acknowledged the ecclesiastical leadership of the Roman Church, and ordered all Christian groups to submit to her authority…. Relapsed heretics were to be put to death… and other dissenters were to suffer confiscation of their goods, and were declared incompetent to buy or sell, to inherit or bequeath; they were excluded from public office, forbidden to meet, and disqualified from suing orthodox Christians for debt” (1950, p. 112). So those who were not orthodox Catholics were forbidden from buying and selling—i.e. conducting business. Indeed, those branded “heretics” faced a death sentence. Thus, the mark of the Beast apparently means general participation in the worship system of the revived Roman Empire. Of course, there are some aspects of worship which delineate those who refuse to participate more than other factors. The little horn, remember, intended to change times and laws—indeed, to change the law regarding holy times—and persecuted God’s people who did not accept its change. God has commanded His people to keep certain times holy and, during these holy times, His people are not to engage in commerce. The little horn changed those times, replacing God’s holy times with times designated by man to be holy. A very obvious aspect of the mark of the Beast, then, will apparently revolve around worship days—indeed, this itself would impact days on which “buying and selling” could be conducted. And the little horn, the woman riding the beast, will cause people to accept the mark of the Beast under pain of death. As in the past, it appears that the woman will influence the political power of the Roman Empire to command people to work during God’s holy times, while prohibiting work at other times, thereby “causing” (cf. Rev. 13:15) true Christians who will refuse to comply to be put to death. The Bible is very clear about which days GOD has made holy—the weekly Sabbath (Friday sunset to Saturday sunset) and certain annual Holy Days, which are also called Sabbaths in the Bible (cf. Lev. 23). God commands His people in Exodus 31:13-17, “Surely My Sabbaths [plural—the weekly Sabbath and the seven annual Sabbaths] you shall keep, for it is a sign between Me and you…. You shall keep the Sabbath… for it is holy to you…. Whoever does any work on it, that person shall be cut off from among his people.” So, in contrast to the mark of the Beast, we have a sign of God and His people—the observance of His Sabbaths. The Sabbath command, it must be understood, is not just for the Jewish people, as many today will argue. Rather, the Sabbath was made, as Christ said, “for man” (Mark 2:27) at the very time when man was created—when there was no distinction between Jews and non-Jews. It was clearly made for both Israelites and Gentiles (Is. 56:6-7). It is interesting to note that, as the people of this world accept the mark of the Beast on their foreheads, so God will place a mark or a sign on the foreheads of those people who anguish over the atrocities at that time. And He will do this to protect them from harm. God tells His angels in Ezekiel 9:4, “Go through the midst of the city, through the midst of Jerusalem, and put a mark on the foreheads of the men who sigh and cry over all the abominations that are done within it…. Do not come near anyone on whom is the mark.” The book of Revelation also talks about God protecting His servants. He tells His angels, “Do not harm the earth, the sea, or the trees till we have sealed the servants of our God on their foreheads” (7:3). In Revelation 20:4, John says, “Then I saw the souls of those who had been beheaded for their witness to Jesus and for the word of God, who had not worshiped the beast or his image, and had not received his mark on their foreheads or on their hands. And they lived and reigned with Christ for a thousand years.” Those who REFUSE the mark of the Beast will be rewarded with eternal life and will rule with Christ during the Millennium, God’s Millennium. Those who DO receive the mark of the Beast will be punished by God: “If anyone worships the beast and his image and receives his mark on his forehead or on his hand, he himself shall also drink of the wine of the wrath of God which is poured out full strength into His cup of His indignation” (14:9). These are serious warnings! We must be sure that we are identified by the sign of God, not the mark of the Beast. Have you ever questioned why people worship on Sunday instead of the Sabbath? Or why they keep Easter and Christmas? Or why they don’t keep God’s commanded Holy Days? We will now look into these matters and see what they have to do with the mark of the Beast. Let’s review again the influence that the little horn has had down through history. Though the weekly and annual Sabbaths are holy to God and He commanded Christians to keep them, the little horn changed the law regarding holy times by substituting other worship days—replacing the weekly Sabbath with Sunday and the annual Sabbaths with traditional holidays like Easter and Christmas. Christmas and Easter are rooted in paganism, as any good encyclopedia will show. Even weekly Sunday worship comes to us from paganism—the honoring of the sun god on the day of the Sun. Some argue that the Bible has endorsed a change from the Sabbath to Sunday. But an honest study of the Scriptures shows that the Bible does not justify such a change. In the New King James Version of the Bible, Hebrews 4:9 says, “There remains therefore a rest for the people of God.” The Greek word for “rest” here is sabbatismos. It literally means “keeping of the Sabbath.” The New International Version reads, “There remains, then, a Sabbath-rest for the people of God.” Perhaps the clearest rendering is in the Lamsa translation which reads, “It is therefore the duty of the people of God to keep the Sabbath.” Yes, if we are God’s people, then it is our DUTY to keep the Sabbath! At the time of King Charles I of England, Cox wrote in Sabbath Laws, “For it will not be found in scripture where Saturday is no longer to be kept, or turned into the Sunday wherefore it must be the church’s authority that changed the one and instituted the other.” He stated that because there is nothing in the Bible to justify this change, it had to be the church’s authority to change the Sabbath and replace it with Sunday. Now what church or what human authority was responsible for changing the Sabbath to Sunday, and replacing God’s designated Holy Days with pagan holidays, such as Easter and Christmas? History shows that it was the Roman Catholic Church. In fact, the Protestant churches that refuse to keep the Sabbath have essentially submitted to the Roman Catholic Church’s authority in this matter. They have not submitted to the Bible’s authority, because the Bible nowhere endorses such changes. Even churches that keep the Sabbath but also keep the pagan festivals of Christmas and Easter, while failing to keep God’s ANNUAL Sabbaths, have, however unwittingly, accepted the authority of Rome as well. In 1845, American Elder Preble observed, “Thus we see Daniel 7:25 fulfilled. The little horn changing times and laws. Therefore it appears to me that all who keep the first day for the Sabbath are the Pope’s Sunday-keepers and God’s Sabbath-breakers.” A very strong statement indeed! The Roman Catholic Church knows full well and teaches that the Bible does NOT endorse or permit a change from Sabbath to Sunday worship. It is clearly expressed in Roman Catholic theology, however, that the church can override the Bible. And this is the basis for their change. Quoting from The Convert’s Catechism of Catholic Doctrine, published in 1946: “Q: Why do we observe Sunday instead of Saturday? A: We observe Sunday instead of Saturday because the Catholic Church transferred the solemnity from Saturday to Sunday.” They admit to changing the day of worship from the Sabbath to Sunday. “Q: By what authority did the church substitute Sunday for Saturday? A: The Church substituted Sunday for Saturday by the plenitude of that devine power which Jesus Christ bestowed upon her.” But did Jesus Christ bestow on her the power to change the Sabbath law? Christ says that HE is the Lord of the Sabbath (Mark 2:28), and nowhere in the Bible does He say anyone has the authority to change what He instituted! In the late 19th century, Archbishop James Cardinal Gibbons challenged the Protestants for their refusal to accept the Roman Catholic Church’s authority over biblical matters. The Protestants believed that ONLY the Bible can tell you how to live. Gibbons pointed out that if they really believe that, then they must return to keeping the Sabbath. He admitted that the Bible nowhere authorized the sanctification of Sunday, but that it teaches the observance of Saturday. These remarkable quotes fit with what the Bible teaches. The Protestant churches compromised on a very essential matter. They accepted a major aspect of the mark of the Beast imposed on them by the Catholic Church (for, as stated earlier, it is likely that the mark of the Beast most visibly involves the rejection of God’s Sabbath and the adoption of the pagan Sunday). There are historical records, though, showing that some individuals and some Christian groups did not accept the Roman system of worship. They stood fast in keeping the weekly and annual Sabbaths as commanded by God. And many were tortured and killed as a result. Here is a report from 1618 about a Mrs. Traske, a Sabbatarian in England: “At last for teaching only five days a week [she was a teacher, but refused to teach on the Sabbath], and resting upon Saturday she was carried to the new prison in Maiden Lane…. Mrs. Traske lay fifteen or sixteen years a prisoner for her opinion about the Saturday Sabbath.” She chose to follow the Bible and the Bible alone! In 1604 in Ethiopia there were some who kept the Sabbath, but due to the influence of the Jesuits, the king of Ethiopia prohibited his subjects, upon severe penalties, to observe Saturday any longer. Much has been written about the Waldenses. They taught and kept the Sabbath, for which they were severely persecuted by the Roman Catholic Church. Reading from A General History of the Sabbatarian Churches, pages 88 and 89, “Of the many who were burned, and otherwise destroyed for Judaism, observes a Spanish author of the sixteenth century, it is not probable that one-tenth were of the race of Israel, but heretics, who, for persisting in saying that the law of Moses was still binding, were accused of Jewish practices, such as circumcision and sabbatizing, to the latter of which [Sabbath keeping] they uniformly plead guilty.” This book shows how Sabbath keepers were identified, how they were then arrested, tortured and finally killed. Recall now the mark of the Beast and how there would be severe penalties for those who would not accept that mark on their forehead or on their right hand. As has been stated, there is strong indication that it has to do with the observance of worship days. Failure to comply with the Roman system in this regard will result in being forbidden to conduct business, which could put true Christians out on the street with no money to buy food. And the easiest way to identify someone’s religious convictions when it comes to keeping such days is to observe when he will and will not work or, if a business owner, when his business is open or closed. God’s Holy Days or Pagan Holidays? So you see, the little horn, the woman that rides the Beast, has been around for a long time, and has blatantly changed what God Himself sanctified. In the process, God’s annual Holy Days were discarded and pagan holidays, such as Easter and Christmas, were adopted. God specifically warned ancient Israel not to incorporate pagan elements in their worship of Him. He says in Deuteronomy 12:30-32, “Take heed to yourself… that you do not inquire after their gods, saying, ‘How did these nations serve their gods? I will also do likewise.’ You shall not worship the Lord your God in that way; for every abomination to the Lord which He hates they have done to their gods…. Whatever I command you, be careful to observe it, you shall not add to it nor take away from it.” The same warning is for us today! But the Christian world today celebrates holidays steeped in paganism, while refusing to keep God’s weekly Sabbath or His annual Holy Days. For example, as already mentioned, Sunday was the day on which pagans worshiped their sun god since ancient times. That is where the name Sunday comes from. Easter was a feast of fertility for the goddess Astarte, also called Ishtar, Ostara or Eostre. Christmas was the holy day of Mithras, of Attis, and of other pagan gods. Remarkably, many pagan “saviors” were supposedly born on December 25, killed on a Friday, and resurrected on a Sunday during Easter time. Christ Himself was not born in December, nor killed on a Friday nor resurrected on a Sunday. Rather, Scripture indicates, with the support of history, that He was born in early autumn, before the rainy season. He couldn’t have been born later than that because shepherds were still in the fields with their sheep. Records confirm that He was crucified on Wednesday and resurrected on Saturday, just before sunset, thereby fulfilling the only sign He gave—that He would be in the grave for three days and three nights (Matt. 12:40). It is no secret that the early Roman Church absorbed pagan elements into their worship, and it was done in direct contradiction to God’s command not to do so. Why? To make the new faith attractive to Gentiles who were already steeped in pagan customs. These pagan customs were placed under a “Christian” mantle so that they would have the appearance of being godly. Traditional Christianity clearly violates God’s command to not learn our ways of worship from the Gentiles, to not add pagan elements to holy worship, and to not delete godly elements that are to be observed, such as the weekly and annual Holy Days. Traditional Christianity has, in effect, accepted the mark of the Beast by embracing human traditions that violate God’s laws. And there have been voices over the centuries warning against such conduct. Although we hear a lot about religious cooperation between sister churches, the Catholic Church has recently made its long-standing doctrinal position very clear, pointing out that all churches outside of the Roman Catholic Church are not “sister” churches. Instead, the Catholic Church considers itself to be the only true Church of Jesus Christ, and it looks upon those in other churches as needing to return to the true fold of Christ, the Roman Catholic Church. Of course, even Protestant churches have never really left that fold completely anyway. For, though they claim sola scriptura (“only the Bible”) as the determinant of their faith, they still follow major doctrines contrary to the Bible that came through the Roman Church from the mystery religions of the ancient world, beginning with Babylon. What the Protestant churches, and all people, need to do is to make a true break with Babylon and really turn to the Bible as their sole teacher. Now imagine for a moment if they were to do that. What would this mean? It would mean they would have to start keeping the Sabbath. They would have to start keeping God’s Holy Days. They would have to cease keeping festivals like Christmas and Easter, New Years, Halloween and other days steeped in paganism. They would have to repudiate a whole host of unbiblical teachings. And they would have to acknowledge the need to obey the law of God and start striving to do so in everything. You don’t have to follow the wayward world around you. You can be different. In 2 Thessalonians 2, the Apostle Paul warns,“Let no one deceive you by any means [indicating that you could be deceived]; for that Day will not come unless the falling away comes first [the falling away from true Christian worship to a false religion], and the man of sin is revealed, the son of perdition, who opposes and exalts himself above all that is called God or that is worshiped, so that he sits AS GOD in the temple of God, showing himself that he IS God” (vv. 3-4). Paul then says, “And then the lawless one [this False Prophet] will be revealed, whom the Lord will consume with the breath of His mouth, and destroy with the brightness of His coming. The coming of the lawless one is according to the working of Satan, with all power, signs and lying wonders, and with all unrighteous deception among those who perish, because they did not receive the love of the truth, that they might be saved” (vv. 8-10). Do you have a LOVE of the truth? You must in order to be saved. The end-time religious leader will claim to be God. And the military leader—the Beast, also called the king of the North—may even believe this for a while. For this religious figure, as we’ve seen, will be given the power to perform signs and wonders. Revelation 19:20 states that the False Prophet “worked signs” in the presence of the Beast “by which he deceived those who received the mark of the beast.” Yet would people really fall for such deception in today’s world? How can Satan’s demons ever be successful in influencing the armies of this world to fight the returning Jesus Christ. How could people ever think that they were able to fight Jesus Christ? Unfortunately, people will apparently be so deceived that they will NOT recognize the returning Jesus Christ. The woman riding the beast has a great deal of influence on people. Revelation 17:2 says, “The inhabitants of the earth were made drunk with the wine of her fornication.” They are made drunk spiritually. They will not know right from wrong, truth from error. They will apparently be deceived into thinking that the returning Christ is the Antichrist. They will believe that He comes to destroy Christianity. It appears that they won’t realize that He is Jesus Christ, our Savior, who has come to restore true worship and to destroy the deceivers. Yes, people can be deceived. A book titled The Nazi Persecution of the Churches from 1933–1945 is quite revealing about events just prior to and during World War II, when the German people literally worshiped their Führer. In this case, the past may indeed be quite telling about the future, as Hitler was a forerunner of the final end-time dictator that will soon appear on the world scene. The author goes on to state, “It is well-known that Hitler believed that he possessed the rare gift of prophetic sight (“Vorsehung”), and based some crucial decisions on this presumed insight…. He sensed invisible demonic forces all around him” (p. 303). Hitler’s anti-semitism, Fischer tells us, went “beyond prejudice; it was a psychopathology of a sort that must be ranked with witchcraft and demonology in the history of the human race” (p. 89). When Hitler was 29 years old, “while still suffering from the effects of a mustard gas attack (at that time he was temporarily blinded), his mind appears to have snapped. It is suspected that he lapsed into a prolonged hysterical condition that seems to have triggered a number of insights of such power that he attributed them to a higher spiritual source” (p. 99). Later, the same book informs us, German audiences seemed particularly mesmerized by Hitler’s voice. “There was something mysterious about it to many Germans, because it didn’t seem to be rooted in any local dialect or class” (p. 124). And notice this regarding the now-famous Bierhallen-Putsch in Munich, November 1923, when Hitler was 34: “Hitler stepped back into the main hall, where the audience had become noticeably restless and impatient, and gave one of the most compelling performances of his life—so compelling that Professor Alexander von Müller, who was in the audience that night, referred to it as ‘a rhetorical masterpiece’ and confessed that ‘never before have I seen the mood of a mass audience change so quickly and dramatically. It was almost as if a sorcerer were casting a magic spell over them’ ” (p. 154). Fischer points out that whenever Hitler listened to music, his friend Kubizek had observed years before, he was a changed man. His violence—because he was very well known for a violent temper—left him. He became quiet—yielding and tractable. Similarly, when King Saul of ancient Israel was plagued by a demon, David played music for him and he too was calmed and soothed (cf. 1 Sam. 16:14-23). Additionally, hundreds of people have attested that the force of Hitler’s personality could not only attract, but convert, those who fell under its spell. Fischer reports about Hitler’s hypnotic eyes, “His eyes fascinated those who came under the influence. They were unusually light blue, with a faint tinge of greenish-grey. Hitler himself confessed that he had inherited them from his mother, whose eyes he compared to those of the Greek Medusa, whose piercing glance could turn a man into stone” (p. 300). Hitler made a remarkable statement in 1938, when British Prime Minister Neville Chamberlain announced that he wanted to visit with him. “On September 13th, Chamberlain dispatched a telegram to Hitler, suggesting a personal meeting with the Fuehrer in hopes of peacefully resolving the Czechoslovakian crisis. The prospect of being visited by a British Prime Minister twenty years his senior, making his first flight to see him, immensely appealed to Hitler’s vanity. ‘Ich bin vom Himmel gefallen’ (I fell from heaven), he reportedly exclaimed after receiving Chamberlain’s telegram” (p. 426). This is not just some common expression in the German language. One can say, “Ich bin aus allen Wolken gefallen,” meaning “I fell out of all the clouds,” in expressing surprise. But the statement “Ich bin vom Himmel gefallen,” “I fell from heaven,” is totally unprecedented in the German language, as used in context by Hitler. But there is a personage who did fall from heaven—many, many, many years ago. This, of course, was Satan the Devil, when he tried to overthrow God (cf. Luke 10:18). The French ambassador later on would say about Hitler, “The same man, good natured in appearance and sensitive to the beauties of nature, who across a tea table expressed reasonable opinions of European politics, was capable of the wildest frenzies—the most savage exultation—and the most delirious ambition…. This much is certain: he was no normal being. He was, rather, a morbid personality, a quasi-madman… a man possessed” (p. 431). And that is what he was! He called his invasion of Poland, “Teufelswerk,” the devil’s work. When it was all over, notice the state the people of Germany were left in: “Germans, now released from the spell, were dumbfounded by what had happened to them. Karl Jaspers [a professor of philosophy] summed it all up well by confessing that ‘during the past twelve years, something has happened to us that seems like the remolding of our entire being. To put it in the form of an image: Devils have been raining blows upon us and have swept us away, together with themselves, into a chaos which has robbed us of sight and hearing…. We have experienced something like the witchcraft madness of the latter Middle Ages’” (p. 345). You see, people worshiped Hitler, thinking he was their savior. Yet he didn’t perform any miracles whatsoever. But the end-time False Prophet will perform apparent miracles and will, thereby, deceive most people. Make no mistake, accepting the mark of the Beast and rejecting the sign of God will affect your future. God commands us to watch the signs of the time and to pray always to be counted worthy to escape the horrible things in store for this world. God warns us to reject the mark of the Beast, and He commands us to keep His weekly and annual Sabbaths, the sign of His people. You are now being challenged to make a decision—either to go along with the rest of the world, which is headed for soon-coming destruction, or to seek God and live by His Truth as it is revealed to you. God’s true servants will receive His blessing and strength. They will live and reign with Christ the King when He breaks these kingdoms in pieces and rules the world in righteousness. The choice is yours to make. We hope and pray that you will make the right one.